Your gift to Watershed supports the Center’s work at many different levels—from the personal experience of resident artists, to the ways that Watershed enriches the culture of midcoast Maine, and the important role that Watershed plays within national and international networks of ceramic artists. Watch the video above to hear from artists and donors why the Watershed experience matters. Intimate residencies with a big impact—Watershed fosters close-knit communities that join 15 artists from around the country and world for a period of two to six weeks—often generating life-long connections and insights. A non-hierarchical, problem-solving environment— where artists explore their own path of inquiry. Our residencies are not focused on a single instructor or a workshop format. Place as a source of inspiration— Watershed’s 32-acre campus is nestled in a valley surrounded by farms in Mid-coast Maine. With a commitment to supporting local food systems, much of our food is sourced from these farms. Facilities that help artists grow— With its large studio building and extensive kiln facilities (including a catenary wood kiln, a train wood kiln, and a gas salt/soda kiln), Watershed offers a space where artists can experiment and extend themselves. 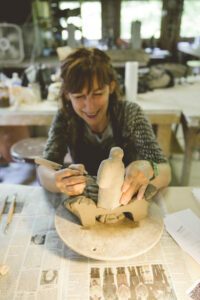 Watershed offers a gathering place for regional clay artists to meet and collaborate on firings and in the studio. Watershed makes art accessible to diverse audiences through its workshops, public talks, community events and educational outreach programs. Watershed draws leaders in the ceramics field, both legendary experts and emerging talent—shining a spotlight on their craft and helping them to inspire others. Watershed helps connect ceramic artists, curating special exhibitions for galleries and events including SOFA and NCECA.